Apple devices such as iPhone and iPad give you a lot of options and possibilities when it comes to scheduling and managing your time, tracking contacts, writing down notes, creating lists and setting up reminders. iPhones and iPads have built-in apps for all these tasks. There are five of them and they are Contacts, Calendar, Reminders, Clock, and Notes. iPhones and iPads allow you to multitask and switch easily between different tasks. To manage your to-do lists, you will need to enable the multitasking feature in the settings of your device. Multitasking on Apple devices means that you won’t have to return to the Home screen every time you want to open a different app. The apps can stay in the memory of your device and you can switch between them by using touch gestures or pressing twice on the Home button of your device. 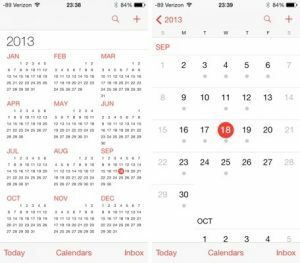 Apple Calendar allows you to easily access an onscreen daybook that you can use to set and schedule appointments and send yourself alerts to remind you of when and where you need to be. You can also sync Calendar with other apps and calendars such as Google Calendar by using iTunes or iCloud. The Contacts app is Apple’s built-in app that allows you to enter, save and store contact information of the people you know. You can also share this information via Mail and Messages. The application comes with a search feature that allows you to easily find the contacts you are looking for. To make recognising the contacts easily, you can attach pictures to the contacts. You can also use the Contacts app with other apps, including Mail. You can also use the app together with Apple’s voice assistant Siri because Siri does recognise the names from your Contacts app.